Take ’em. Break ’em. Make ’em. O Grand Master, it is your females that will save this species. It is through their power, their innate abilities that man will be saved. Compassion and love must rule the day again. And power must be crushed by the mallet of humility before any dare send another child into war that old men dream of winning as if playing games of adolescent ruffians. Ouch! Give up my manhood? Turn in my boxing gloves, my rifle, my drink? What will I become when I grow up? Who will I protect, gather food for, “sexualize” in thoughts actions and deeds my every waking minute? You will bow and respect for evermore your Divine Mother. I will take your life away as quickly and as surely as I have given it to you. Obey this: Be Still, and Know that I Am God. I need your strength to build, not tear down; to give hope and not despair; to “fight” without lifting a fist but by raising your spirit so mightily it will dash to pieces the most formidable enemy your kind has ever faced. Shed tears not for fallen comrades but for the joy in conquering obscurations you never thought could be overcome. March proudly waving flags of festive, holiday colors to announce a new day is here and that you will never return to the days of old guts and glory. You will thrive only when realizing that skillful means discerned with honest and gentle wisdom must be employed in all human endeavors. Love, tolerate and above all learn patience as the antidotes to all the poisons your kind has been exposed to. Do it now. Tomorrow may be too late. I will spare man, but only if he spares the feminine within himself. This entry was posted in Bodhisattva, healing, Inspirational, Letting Go, meditation, Mother, Spiritual But Not Religious, Surrender, understanding and tagged awakening, Buddha nature, compassion, Compromise, culture, enlightenment, equality, God, gratitude, heartfelt, Higher Self, HIGHLY SENSITIVE PERSONS, Love, relationships, Spiritual, spirituality, War. ← Pass on Unconditional Love Right Now! 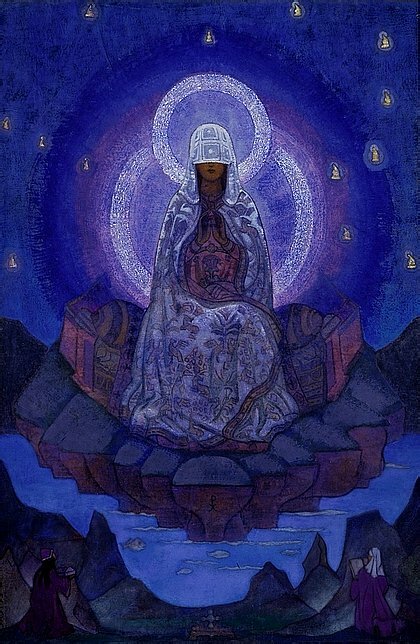 We should all seek the divine mother within us . . .